When life gives you lemons, kill zombies — turns out lemon juice neutralizes the undead. After a failed attempt at running away, best friends Nathan and Misty return home expecting to face angry parents. Instead, they discover the military has destroyed the bridges out of their rural town and everyone’s fled–except a small horde of the living dead. The stress of flesh-eating zombies may be more than their already strained relationship can handle. Even with the help of the town geek and lemonade-powered Super-Soakers, there’s not enough time to squeeze their way out of this sticky mess. Unless the trio eradicates the zombie infestation, while avoiding the deadly zombie snot, the military will blow the town, and them, to pulp. Their only shot is something with a lot more punch. Something like the Super Zombie Juice Mega Bomb. But even if their friendship survives, there’s another problem: Someone has to lure the undead into the trap. Includes two free short stories. Print version is approximately 204 pages (40,000 words). Parents note: This book contains no cursing or strong language, and no explicit gore or violence. However, scenes of intense zombie action may be disturbing to younger readers. Punctuation in some reviews may be corrected. Epic Zero 2: A Galactic Showdown of Epic Proportions! 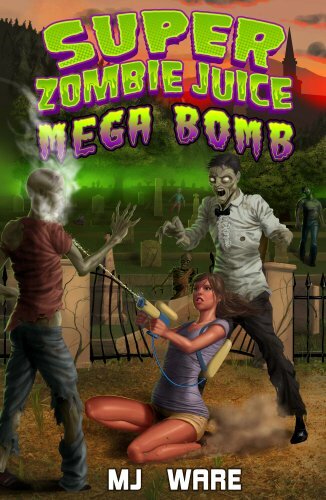 This is the Kindle version of Super Zombie Juice Mega Bomb (A Zombie Apocalypse Novel Book 1) that you can also download and read on your computer and mobile phone. Kindle books are DRM protected and therefore, unlike ebooks that are in PDF or ePUB format, you cannot read this ebook without the official Kindle apps.